7 What do we know? In August of 2011 I published “the picnic at the edge of the universe“, an eBook now available From the iBookstore (Apple), Barnes&Noble, and Amazon. In it I lay out a brief history of our concepts of the universe and a new model of its probable origins, growth and development within and as part of its environment. Here I would like to summarize the central premise of that book as I saw it and tried to express it. I welcome your comments. The model that underlies the basic premise of the book can be simply described: We, you and I, and our local universe arose and now exist as a set of complex organized distortions (not “matter”) within and as a part of a vastly larger entity, an electromagnetic ether characterized by its high energy, high frequency, and high entropy, that exists within and around the near universe that we perceive. Like us, our universe is finite, meaning that is has a boundary, an edge somewhere out there, still beyond our perceptive reach. And, like a protozoan in a nutrient bath, the energy it absorbs from its surrounding medium provides the fuel for its rapidly accelerating growth and expansion. As for this “cosmos,” the evidence for its existence as a pervasive and surrounding medium may be scant, but can be seen as persuasive. It’s presence is strongly suggested by the fact, one that most scientists agree on, that light, the electromagnetic phenomenon that makes all this perceivable, has a strict speed limit, 299,792,458 m/second, a limit that might be accounted for only by the resistance, the electromagnetic viscosity, so to speak, of the fundamental medium over which it is propagated. It is also entirely supported in the words of Albert Einstein in his address at the University of Leyden on May 5, 1920, which he concludes by saying, “Recapitulating, we may say that according to the general theory of relativity space is endowed with physical qualities; in this sense, therefore, there exists an ether. According to the general theory of relativity space without ether is unthinkable; for in such space there not only would be no propagation of light, but also no possibility of existence for standards of space and time (measuring-rods and clocks), nor therefore any space-time intervals in the physical sense.” More near at hand, it can be inferred from the presence of both local and larger, more general magnetic fields which can be explained as otherwise invisible distortions of that background. A possible “good guess” at the average frequency of the electromagnetic ether might be 1/h, h being Planck’s constant, a value itself derived from the relationship of energy levels to the velocity of light. The origin of our particular universe then likely lies not in an explosion of massive dimensions, creating ‘something from nothing’ as many quantum theorists presume, but from random interactions, resonances, and reinforcements of perturbations in that ether, creating distortions in the field that rise to stability by processes similar to what we find in the workings of cellular automata, phase transitions and other simple mechanisms to larger, more complex states and conditions of more concentrated energy levels, by procession, aggregation, attraction, and interaction. These processes controlled by perhaps very simple rules, have now, after billions of years of development, become the vast, complex organization we have spent thousands of years of observations and attempts to model and make sense of. Our universe, then, can be seen as a very large, complex distortion in the field of the ether, both surrounded and permeated by that ether, which by its own structure establishes certain limits and rules, including the maximum speed of light. Within the universe itself other higher level distortions are formed, nodes that appear to us as stars, clusters of stars we know as galaxies and even larger clusters of galaxies. The higher energy level of these nodes generates more generalized distortions of the ether, notably those not yet visible phenomena to which we have given the name dark matter, unseen by us except through its effects on more visible phenomena. In fact, we and our local galaxy undoubtedly lie within one of those dark matter regions generated by the high energy levels of the stars in our own galaxy, the milky way. This image, created by Richard Massey through his analysis of Hubble images, gives us an idea of how the “dark matter” surrounding the high energy phenomena in the universe might be seen if it were visible. The bright elements within these magnetic fields are not from the original images but were added to show how the structures might be organized. For example, our galaxy might be one of those bright dots. This approach to the structure of the universe also makes it possible to explain, in a simpler manner, the more recent mysteries noted by observers, like gravitational lensing, dark energy, and dark matter. 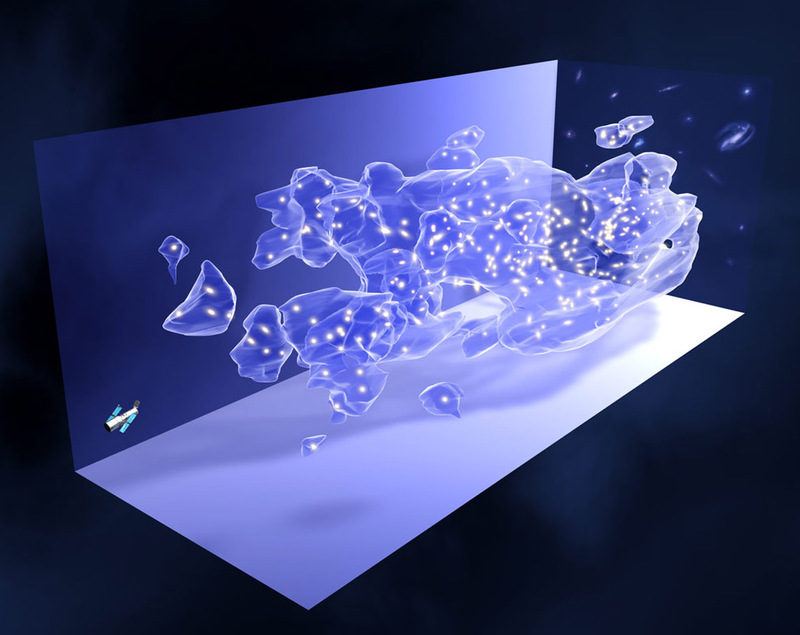 For example: for dark energy, it offers the background field of the cosmos, both outside and inside of the universe; for dark matter, the powerful distortions of the background field, generated around and between the high energy concentrations of stars, galaxies, and clusters (what we here in the zone of middle dimensions would call magnetic fields), which would also explain gravitational lensing phenomena. At the other end of the scale it gives a sense of truth to one of Einstein’s early intuitions, that “particles” might one day turn out to be just condensations (or wrinkles?) in the ether (from the Leyden speech, cited above). This model of the origin and structure of the universe is notable also, in that it does not require more than the three dimensions we know and understand here in the familiar world in which we evolved. It returns time, confiscated and given a false quality of physical substance in Relativity theories, to its actual place as simply the measure of the persistence of phenomena. It gives us a clue as to where magnetism, that well-used but mysterious source of much of our power, might have originated. And by reducing the number of elements needed for its structure to just types and levels of energy (accepted as true by our particle and quantum physicists when they express the “masses” of dimensionless particles not as weights, but in energy levels, in values of electron volts), we may ultimately simplify both our conceptual view of the universe and the mathematics underlying its description. I have based the book and particularly its arguments on my own and many others’ dissatisfaction with “the standard model”, with mathematical cosmologists’ and quantum theorists’ obsessions with so far unseen “particles” and their seemingly paradoxical behavior, with their increasingly willing belief that the math is the reality, and with their seeming inability to step further away and to consider any alternatives to these admitted mysteries. I was familiar with ‘the game of life’ and earlier work based on it in finding complexity generable from both simple beginnings and a few simple rules, but, I must confess, I have only belatedly come into possession of Stephen Wolfram’s 2002 book “A New Kind of Science” and its vast extension of those concepts. This has been a revelation to me and an unexpected validation of my own thoughts and intuitions. Charles is a recently retired architect/planner and generalist problem-solver with a lifelong interest in science, physics, and cosmology, and the workings of the human mind. He has started this blog in the interest of sharing his ideas with others of like-(or not so like) minds. This entry was posted in 1 the picnic... Bookmark the permalink. I’ve always wondered what the “edge” of our universe looks like to those observing it. Is there an “out there” or an “in there” as we look back into our own universe or look out into something else? However, your insight has caused me to think differently. The model you discuss offers up a very different model from the one that is often communicated by physicists. The model, shown brilliantly by the graphic, suggests an almost shapeless universe defined by the perturbations in the ‘ether’. If these perturbations are random, is space (as created by the perturbations) continuous or discontinuous? For example, if the frequency and intensity of the electromagnetic perturbations are random, thus causing certain regions of the electromagnetic ‘ether’ to be quiet, are there areas of no space and thus no universes as we might define them? If I understand your idea correctly – and I could be way off base here – the concept of a multiverse (not necessarily copies or versions of the one we inhabit) could be perhaps explained by random, sequential and simultaneous perturbations in the electromagnetic ‘ether’ which create the spatial environments that operate in ways similar to our own universe – or maybe the circumstances of those other ‘spatial’ regions are utterly different and last longer or a lot shorter than ours. After reading your “Universe – simplified”, I’m drawn to conclude that the universe – the one much larger than the observable universe we can see – is not necessarily like a bubble in a Swiss cheese whose diameter was once a Planck length before it suddenly expanded. And inflation, under this same assumption, is simply more electromagnetic perturbations occurring in the ‘ether’ creating new space, which we measure, concluding incorrectly that the single volume of space we know as the universe is expanding. Fascinating ideas, Chuck…….very thought-provoking indeed!! So where does the electromagnetic ‘ether’ come from and does it have an edge? Maybe I have the wrong end of the stick throughout all of this…. Thanks for what I have been wishing for – intelligent commentary. I was going to recommend looking at the Wikipedia page on “Conway’s Game of Life” which demonstrates what may have happened after the first self organizing event occurred, but you must know it if you have Wolfram’s compendium. I hope you have his new iPad version, not the 1200 page, 5-1/2 pound volume on my desk. I think there could be more than one universe in my model, and maybe some that didn’t make it to maturity or were reabsorbed into the ether/cosmos. We’ll never know. The book may answer other questions but I’ve continued to test ideas since I let it go back in August. Thanks again for your comments. I have that 5 1/2 pound tome so will migrate soon to the iPad version! Easier on the biceps! I was thinking about this a lot last night and also over breakfast today. I remain intrigued by “edge conditions” especially has I have in my minds eye an infinite “lump” of electromagnetic fields rather like an infinitely large English seed cake my grandmother used to make. In this infinite cake of electromagnetic fields, each seed is unique – some small, some lumpy, some more spherical and others more like filaments. In my analogy, the universe we inhabit is one of billions of unique seeds and for each seed there is a middle and an edge….. I ask myself, what does the electromagnetic cake material look like to someone close to the edge of their particular seed? When looking “out” of the seed from the seeds edge, is it like looking at a star-and-galaxy-free (and impenetrable) wall of nothing except random flickers from galactic Aurora Borealis – because there’s no space there – and just like our night sky when you look “into” the seed’s center? Again, my mental model of edges and seeds my be off base…….especially given that Brain Greene and others speak eloquently about our universe possibly having 11-dimensions…..